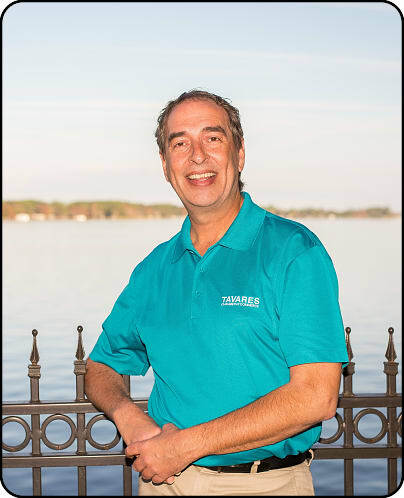 J. Scott Berry became the Interim Executive Director at Tavares Chamber in March of 2016, a position that was made permanent in July of 2016. J. Scott owned J. Scott’s Skin Care & Day Spa in Downtown Leesburg from May of 2005 through November 2016. J. Scott has been incredibly involved in the Lake County community for 15 years and in 2015 was awarded the highest award in Lake County, Special Recognition for Community Service by Leadership Lake and Lake County Chamber Alliance. He has served on many non-profit boards including: Melon Patch Community Theatre (President 3 terms); Lake Sumter State College (President); Leesburg Partnership (3 years executive board); Leesburg Center for the Arts; Historical Preservation Board (3 years as Chairman) and Boys & Girls Clubs of Lake and Sumter Counties (still serving on the executive board). J. Scott has been honored by the Florida Commissioner of Education for business support of education (2014), his day spa was named International Spa of the Year by leading skin care company Repechage (2012) and was honored for outstanding leadership by the Leesburg Chamber of Commerce (2014). He was also crowned King Rex of Leesburg Mardi Gras in 2010. J. Scott was born in Sumter County and graduated from Lake Sumter State College before moving to Jacksonville to purse his Bachelor of Fine Arts at Jacksonville University. He returned to Lake County in 2001 and has been invested in all areas of the community ever since.